The names Narcan (naloxone) and Norcuron (vecuronium) look alike when handwritten and sound alike when orders are transmitted verbally. Three cases in which patients in respiratory distress from opiate overdoses needed Narcan but inadvertently received Norcuron, a neuromuscular blocker, have occurred. To prevent errors, Narcan should be ordered by weight, in milligrams, rather than by volume, as in the number of ampules or vials. Norcuron doses are also typically higher than Narcan doses. Vecuronium is available in 10-mg or 20-mg vials. 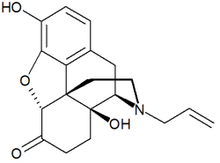 Naloxone is available in 0.04-mg, 0.4-mg, and 2-mg ampules and 4and 10-mg vials. Marsam Pharmaceuticals packages generic vecuronium in vials with caps, closures, and labels that are prominently marked, "WARNING: PARALYZING AGENT." This warning statement may deter an accident.